With 48 years of experience under their belt, Village Camps is a well-respected institution in Switzerland taking summer camps for girls and boys aged 7-18 years to a whole new level. Village Camps’ motto “Education through Recreation” encourages campers to become more independent, discover new hobbies and improve social skills in a fun and exciting way, helping them to become more confident and better individuals. 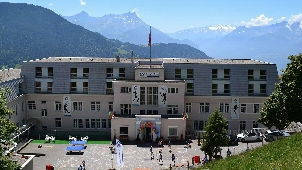 After picking them up at Geneva Airport, they are transferred to the idyllic Leysin campus which not only offers scenic views of the Swiss Alps but also a wide range of superb indoor and outdoor sports facilities including indoor swimming pool, ice skating rink, tennis court, archery range, football pitch, basketball court and climbing wall. The summer camp’s small camper-counsellor ratio (1:6) ensures that each kid is well looked after and receives personalised attention. The daily schedule is divided into three parts. From Monday to Friday, campers devote 3 hours in the morning to their chosen programme which can be Tennis, Film Academy, Adventure, Sports, Dance or Languages. During the afternoon they are encouraged to discover new activities suitable for their age such as archery, hiking, teambuilding, leadership based activities, etc. While in the evenings everyone gets to have a good time with fun-filled events such as talent nights and discos. Cultural trips to Geneva or a cheese and chocolate factory in Gruyères are also organised. And the excursion to the outdoor water park in Aigles is always a favourite for everyone! Village Camps also organises summer camps in Switzerland, France, Austria, Portugal and Canada. If you’d like more information about these programmes do not hesitate to contact us.